Located in Calgary North, Calgary B C Acupuncture Clinic has been servicing Calgary and surrounding areas for many years, helping its patients restore their health naturally through alternative medicine and therapy. Founded by Dr. Bill Chan and his wife Cindy, Dr. Chan is a registered acupuncturist in the province of Alberta and also a certified Traditional Chinese Medicine (TCM) doctor; Calgary B C Acupuncture Clinic specializes in acupuncture and Chinese medicine for the treatment of pain relief and management, stress, insomnia, migraines, headaches, obesity, weight loss, infertility and the general prevention of diseases through optimal health maintenance and natural healing. By providing ear acupuncture, laser acupuncture, electro-acupuncture, cupping, gua sha (scraping therapy), Chinese herbal medicine, nutrition counselling, and tui na (Chinese massage), Calgary B C Acupuncture Clinic has developed a reputation of knowledge, friendliness and passion and treats patients one-on-one with the utmost respect and understanding. Please call us at 403-455-8811 (tap to call/text) to book an acupuncture appointment today! Insurance* (click for details), MVA* (click for details) & WCB claims are accepted. Acupuncture is a safe, effective and drug-free therapeutic method that can help address a wide variety of health problems. This holistic therapy helps to reduce or relieve pain, strengthen the immune system, prevent diseases, support physical and emotional health, and improve function of affected areas of the body by inserting, manipulating and retaining very fine sterile filiform needles into specific acu-points on the body. Acupuncture is a key component of Traditional Chinese Medicine that originated in China over 5,000 years ago, making it one of the oldest and best known of the alternative therapies in the world today. 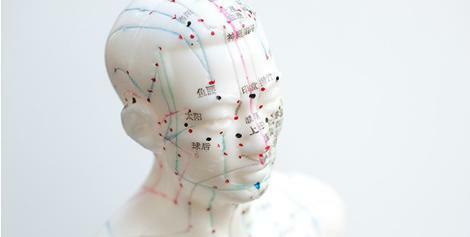 For a more detailed look at acupuncture, you can peruse this report from The World Health Organization (WHO). From childhood, Dr. Chan has possessed a strong interest in Chinese medicine and learned much of his techniques from his father, who also practiced Chinese medicine. Dr. Chan went on to study further with his father, who has over 60 years worth of clinical experiences in China. 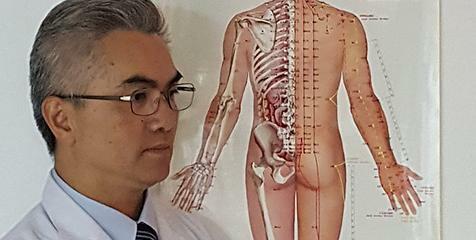 After graduating with a four year Doctor of Acupuncture and Traditional Chinese Medicine Degree in Canada, he studied even further at the Beijing University Hospital in China before passing the Alberta Health Disciplines Board Acupuncture licensing exam and receiving a certificate of completion in Master Tung System Acupuncture. Dr. Chan is a member of the Alberta Association of Traditional Chinese Medical Doctors (AATCMD), College and Association of Acupuncturists of Alberta (CAAA), Natural Health Practitioners of Canada (NHPC), and is active in the promotion of Traditional Chinese Medicine and Acupuncture in Calgary. Dr. Chan is one of the Top Acupuncturists in Calgary on the website:https://www.ratemds.com/doctor-ratings/dr-bill-chan-calgary-ab-ca. "I was in a car accident April 2014. Went to Physiotherapy for 9 months and nothing seemed to work . I had a cortisone shot in Dec and that also didn't eliminate pain . Then a co- worker referred me to DR Chan and he has been doing acupuncture and cupping on me . I have only seen him 4 time so far and my chronic pain is gone I feel the best I have felt since the car accident . Thank you DR Chan for being a great Doctor and also a carrying individual . I am looking forward to more sessions as cupping is better than any massage." "Dr. Chan is so far the best health care provider I met in Calgary after 8 (eight years) of searching for the best healthcare possible. Excellent results, outstanding healthcare quality, very deligent and professional, through knowledge of TCM (Traditional Chinese Medicine), and most of all genuine care for his patients. What else can I say? After multiple car accidents that I go through, after spending lots of sleepless nights browsing the internet in search of an outstanding health care quality, after transferring from one therapist to the next for 8 years in search for the best among the best... At last! The search is over. I have been treated by Dr. Chan for almost 6 months now and I highly recommend him to all my family and friends..."
"I have done quite a bit of research which brought me to Dr. Bill Chan. I have a chronic condition called trigeminal neuralgia. Over the years I have been on numerous medications and have had even microvascular decompression surgery. I was in remission also for several years but recently when my pain came back in my face it was excruciating. I couldn't see my neurosurgeon for at least 6 weeks so I had to do something. I did not want to be on narcotics to control the pain as they often don't work for nerve pain, so it was time to take my health into my own hands. I am also a health professional and I have read many articles. I also read that according to the WHO (World Health Organization) acupuncture is recognized as a treatment to help trigeminal neuralgia. So I gave it a try. I have been going to see Dr. Chan for 6 weeks now and have seen a great improvement. I am still on medication but hope to reduce the dosage and eventually not have to rely on them anymore. I just have to say I have appreciated Dr. Chan's knowledge, professionalism and his ability to listen. He is never rushed. He has helped me tremendously. I came into his office not being able to chew any solid food without constant pain. Talking, laughing, chewing and even brushing my teeth would cause me to have an attack that can best described like someone stabbing you with a knife. The nerve pain I felt can basically be described as a "short circuit" in my face. My journey is not complete, but I definitely can see results with acupuncture. I am able to chew solid food again and not have those excruciating attacks like I did. I would highly recommend Dr. Chan and his expertise. "After seeing both a physio therapist and an osteopath for close to 8 weeks for nerve pain in my hip, and not getting any improvement, Dr. Chan's treatment provided near complete relief from the pain in 4 visits. Highly recommended." "I had neck and upper back pain and I was amazed that just after a few treatments, I noticed a BIG difference! Dr. Chan guided me through everything, answered all my questions, and is always very patient. It is private and relaxing treatment room. Each acupuncture session lasts one hour, and Dr. Chan treats one patient at a time. I am very thankful. I highly recommend this place!!!" "Ours was a rather special case as my 20-yr daughter was just visiting for a week. But Dr. Chan was very helpful beforehand and throughout that week to make the most of her time. Diagnosed with fibromyalgia, she had a very painful 4-hour flight here to Calgary -- but her flight home was much easier. Dr. Chan treated her with a combination of electro-acupunture and TCM." "I was referred to Dr. Bill Chan by a co-worker of my spouse who had been in a similar condition and said that she had been restored her health. From the very first time seeing Dr. Chan, it was clear that I was in the care of an extremely knowledgeable and proficient acupuncturist, passionate about his profession, but also teacher and a healer. It was at once calming and inspiring. I left that day realizing that I had not just the possibility, but a certainty of becoming myself again, moving with joy and confidence rather than the pain and apprehension that afflicted me for several years." "I was diagnosed with Carpal Tunnel Syndrome a few months after having my newborn. I've tried wearing wrist braces at night while sleeping and going to physio, but the constant bending of the wrists from holding, feeding, and rocking a baby made it hard to improve my condition. Some nights I couldn't sleep because my hands were so numb and painful that they felt like they were on fire. I was desperate to find healing so I decided to try acupuncture after my dad referred me to Dr. Chan. He really took the time to understand my condition before starting my first treatment. I was very surprised that I felt much better after just a few treatments and I was able to sleep well again! My CTS permanently went away after a couple more treatments. 6 months later I had another problem - I woke up with intense lower back pain. I went to a chiropractor for the first time. Initially it seemed like it helped but after seeing him for a month I realized that the pain wasn't going away completely. I went back to Dr. Chan and he healed my back in 4 treatments! I highly recommend Dr. Chan as he is caring, a good listener, and great at explaining things as I ask him a ton of questions at each appointment. When my neck pain flares up again (a few times a year from a MVA years ago) I know that I'd be seeing Dr. Chan as previous physio appointments didn't seem to heal that permanently either." "My first experience with acupuncture was because I had so much pain in my neck, shoulders, and back that no massage could alleviate. I couldn't sleep at night, the pain was so excruciating, so I went in to see Dr. Chan on a recommendation of a friend. We spoke for 20 minutes before the treatment; my sense from that discussion was that I was dealing with a competent professional. After the initial acupuncture treatment (about one hour) I felt almost pain free immediately and I felt like I didn't need since the pain was 100% gone the next day! Thanks to Dr. Chan, it was very good. I always recommend this place to close friends and family"
"On October 26, 2014 I had a very serious accident. I fell with my face on a stump, used as a stool around a fire pit, hitting the right side of my nose between nose and cheek on the edge of the stump. The impact was so severe that, though no skin damage was evident, the flesh between my nose and cheek and inner lip was so shattered tha hole was visible when seen under the lip. All this happened about 11am. About 3pm the doctor at the emergency department of a local hospital told me there was nothing they could do for me; the injuries would have to heal on their own and sent me home. 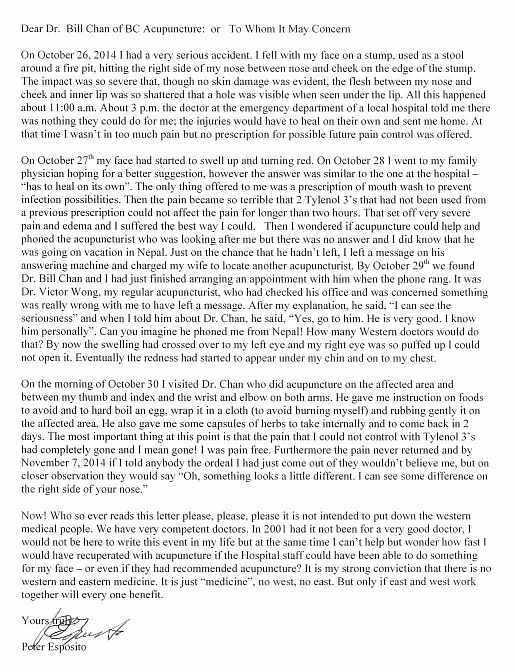 At that time I wasn't in too much pain but no prescription for possible future pain control was offered..."
"Dr. Chan is an incredible man! I first went to see him after much research and what appealed to me is that he is registered in both traditional Chinese medicine and Western medicine. I felt I would be in good hands. Our first appointment was long, as he is a tremendous listener, wanting to really know the source of the problem. I found him to be attentive and sincere in his approach. Having spinal problems, with lower back pain, in addition to nerve pain in the legs after surgery, I had a lot going on. After 10 sessions, I felt so much better and as a result went back to work teaching. I continue to go back whenever the pain arises. I simply cannot say enough good things about him. It's worth a try, as drugs do not do what acupuncture can do!" "I was in chronic pain for 1 year+ because of surgery. Nothing helped. I was a level 3-5/10 pain everyday. After 1 treatment I felt 100% better! If you need help go see him!" "Dr. Chan has been a great help to my health. Over the past 6 months of regular visits I have seen chronic conditions I had accumulated over the years disappear or minimized. Dr. Chan runs his practice with an emphasis of quality over quantity. I never have felt rushed in his office – this I believe is what really sets him apart from his peers as I have visited many acupuncturists and all are so hurried and rushed! With a slower patient focused pace symptoms can be explained clearer and a diagnosis and treatment can be identified easier. Without a doubt I would recommend Dr. Chan!" "I initially went to Dr. Chan for pain in my shoulders at the recommendation of a friend and after 3 treatments of acupuncture and cupping I no longer get this usual pain. At the same time I mentioned I was experiencing leg and foot cramps every evening and which often woke me during the night. No calcium, magnesium, potassium through food and supplements nor plenty of water made any difference so Dr. Chan began acupuncture treatments to address this problem and after 5 treatments I am completely free from cramps. Such a blessing! Dr. Chan is not only knowledgeable but so easy to talk with. One feels completely comfortable with this caring man." "I have severe migraine and I would like to thank Bill for helping me control the pain since medication wasn't working. I will continue to seek his treatment." "I had acne problem for years. Thanks for Dr. Bill Chan, using the combination of acupuncture and Chinese herbal treatment, targeting the various causes of acne, now my skin condition has improved a lot! No need to cover up before going out!" "My back pain is gone. I have been treated to use combine Acupuncture and Chinese Medicine by Dr. Chan. Thank you so much"
"Thank you Dr. Bill Chan to use combine acupuncture and Chinese herbal medicine to treat my period problem. My period problem is normal now." "Thanks for your patience and good experiences to treat my knees pain and my right arm pain, now I am much better." "I appreciate the acupuncture services in achieving very much improved mobility, especially in the right shoulder. I have benefited and appreciate Dr Chan's knowledge of traditional Chinese medicine." "Amazing Result : I have been seeing Dr. Chan for a while. With his acupuncture service as well as using the traditional Chinese herbs, my health issues being improved a lot. I appreciate his professional service with patience and earnest care for patient like me. I also refer him to my family members especially my two children ,who are both athletics, experienced his help with acupuncture a lot . It's amazing effect." "Dr. Chan has a wealth of experience in acupuncture and traditional Chinese medicine." "I have been treated by Dr. Chan several times over the last couple years; both with Acupuncture & Chinese Herbs. Dr. Chan has a wealth of knowledge & experience in both therapies. I have also referred several massage clients of mine that I thought could benefit from Acupuncture treatments, knowing that with Dr. Chan they are in great hands!" "It's hard to explain the gratitude I have for Dr. Chan. I've suffered with chronic migraines for over 25 years; and within 2 treatments there was an 80% improvement...that's incredible." Pain is the body's disease alarm signals, different conditions may be different pain signal! Do NOT live reluctantly, it is possible to delay treatment. Painkillers on the market are mostly anti-inflammatory drugs, they may have gastrointestinal, liver, kidney and other serious side effects... Below link is a researchreport from www.theguardian.com: https://www.theguardian.com/science/2016/sep/28/common-painkillers-linked-to-increase-risk-of-heart-failure-bmj-finds?CMP=Share_AndroidApp_Copy_to_clipboard. Acupuncture is drug free therapy for pain!